“Who Murdered the Detective? A Dark Evening on Intrigues, Plots and Unsolved Mysteries” will take place at Mishkenot Sha’ananim on Tuesday, March 7, 2017, with authors Petros Markaris and Dror Mishani. The event will be held in English, and is open to the public free of charge, advance registration is required. Petros Markaris is a leading intellectual in Greece, as well as author of the Costas Haritos series of detective novels, and has collaborated with Theo Angelopoulos on several screenplays. The first three books in his fiction series have also been published in English: Late-Night News (Deadline in Athens in the U.S.), Zone Defense and Che Committed Suicide. Israeli crime fiction author Dror Mishani is also a translator and literary scholar who specializes in the history of detective fiction. His series of novels featuring police inspector Avraham Avraham has also been published in English, under the following titles: The Missing File, A Possibility of Violence, and The Man Who Wanted to Know Everything. The two authors will converse with Oren Nahari on stories about unsolved mysteries, favorite detective characters, and the Mediterranean detective. The evening’s program will include actor Roy Assaf (God’s Neighbors, The Kind Words, Wounded Land) performing monologues of great detectives, with the talented duo of Maya Belsitzman (vocals and cello) and Matan Ephrat (percussion) providing musical interlude. The event will take place in English on Tuesday, March 7th at 19:30 at Mishkenot Sha’ananim Cultural Center, Jerusalem. Register online via this link. On Wednesday, March 8th, Petros Markaris will conduct a screenwriting workshop at 10:00, in Hall 222, at the Bezalel Academy of Art, Jerusalem. Admission is free, on a space-available, walk-in basis. 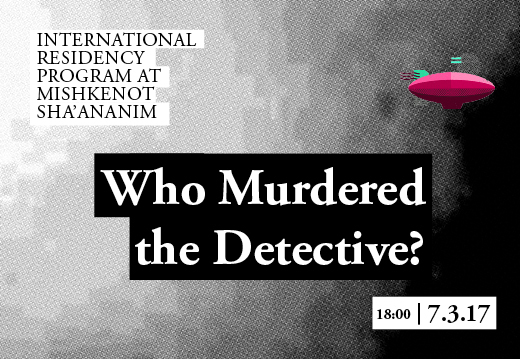 On Thursday, March 9th Petros Markaris and Dror Michani will conduct a Detective Fiction Writing Workhsop – “Murder at Mishkenot” at 18:00 in Djanogly Hall, Mishkenot Sha’ananim, Jerusalem. Admission is free, advance registration is required. Register online via this link. All events will be held in English. Please note that programs are subject to change, contact Mishkenot Sha’ananim for further information.